Can Exxon sustain its prestigious title? Over the past few weeks, I've been working my way through the nine dividend aristocrats on the Dow Jones Industrial Average (DJINDICES:^DJI). Up today: ExxonMobil (NYSE:XOM). The oil giant's consecutive dividend streak started in 1983, and the dividend of $2.52 gives the stock a current yield of 2.70%. That puts Exxon within the top half of the Dow in terms of yield. 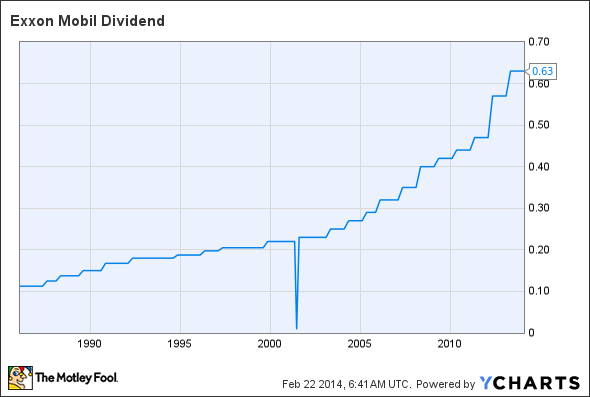 Before we look at how stable Exxon's dividend is, let's see where the current run began, and how we got here. Note that the dip in the early 2000s was due to a stock split. Given the constant global demand for the resources Exxon produces, most would consider this to be a very stable dividend-paying company moving forward. But even a reliable dividend payer needs to have its share price appreciate to become a great investment. 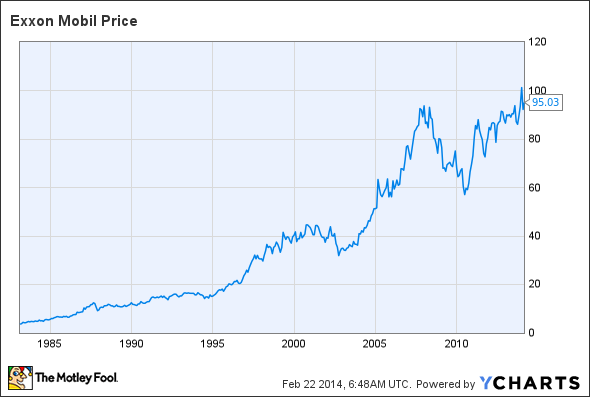 So what has Exxon's share price looked like since 1983? The stock has performed wonderfully over that time frame, up more than 2.57 thousand percent. Even without the dividend increases over the past 31 years, investors who have held the stock over that period have done well for themselves. But will those kinds of returns and dividend increases continue? Among the world's largest companies, Exxon recently fell from second place to third. That may not be a big deal, but perception counts for a lot, and as the Law of Large Numbers comes into play, it's likely that the company's share price growth in the future won't match its performance of the past 31 years. On the other hand, Exxon remains the world's largest oil and gas company, and with increasing worldwide demand for energy, the company should at least continue to turn a profit in the long run, thus pushing the share price higher. As for the dividend, Exxon currently pays out only 33% of its cash. The rest goes toward share buybacks and investments back into the company, mostly in the exploration side of the business. 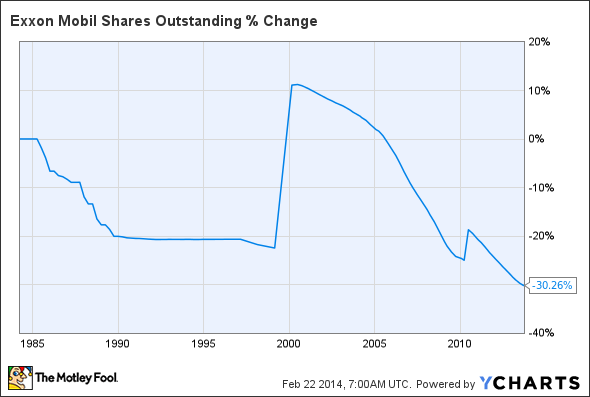 Exxon has cut its number of outstanding shares by more than 30% over the past 31 years. That's a good thing, but not in the way Exxon has done it since 1983. In the late 1990s, Exxon's share count spiked after the company had spent years bringing it lower. Then it began to fall. It appears as if management wasted shareholder value to the tune of billions of dollars over the past 31 years. Had that money been spent on dividends, investors would be much better off right now. I point this out because if Exxon cuts back on the share repurchase program and focuses more on dividend increases, the company could substantially increase the payout ratio from 33% to more than 50%, regardless of any increases to revenue. To me, that indicates that Exxon's dividend is very safe. This dividend aristocrat has the means to maintain its payout in the future, even if the economy again heads south or Exxon experiences other problems down the road.